Last year, in July, I got a note from my insurance company that my house had officially reached 60 years old. I was going to blog about it, with a few cupcakes with candles sitting on the front steps, but forgot and, well, here it is February of 2014. When you live in a house of this age, there are all sorts of things that just cease to work over time. Such was the case with my overhead lights on the west side of the house. It started with the light in Carole's bedroom. 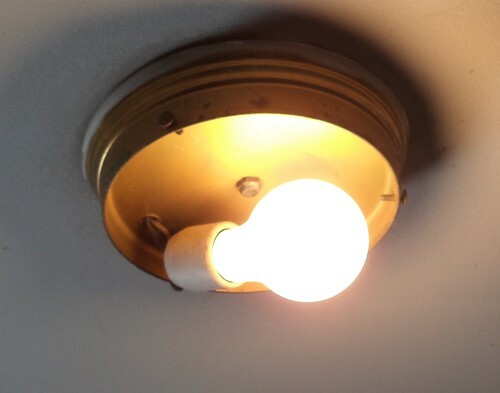 That one had the light bulb crack in the fixture, which I didn't realize or had forgotten. It had not worked in years. Next came the light for the deck. After that, it was the kitchen light. Finally, the light in my home office. What would happen is the light would flicker when you turned it on. It would still come on, but, gradually, it would not come on and then it would and then, finally, it quit working all together. I am nothing if not adaptable. I just wouldn't go into the back room at night. Cleaning the litter boxes was a day job and, even if I knew they needed cleaning, I just wouldn't do it in the dark. For the kitchen, I had the light over the sink for a long time, but that went out, just like the others. So, I took to having the fridge and freezer and microwave doors open, their bulbs illuminating the kitchen enough that I could cook. Dishes piled up because I couldn't see to do them, but careful planning or just deciding to eat a microwave meal, meant there weren't a lot of dishes to wash at the end of the week. And I had the sunshine floor lamp in the home office. It was actually better for my eyes not to have the overhead light on. I adapted while I scrimped and saved with the idea of hiring an electrician to fix these problems. Finally, two weeks ago, in between these weekend snowstorms, one came to take a look. He comes highly recommended and he was very personable and extremely knowledgeable. The first thing he did was look at the problems. Step 2 was to go look at the fuse box. He removed the cover surrounding the fuses and, to my horror, there was a mouse nest in the bottom of the box. No, I wasn't about to take a photo for all of you to see. You know I have had problems with mice but I thought I had fixed that. I was terribly embarrassed. Ryan said he'd never seen anything like that before. I quickly cleaned it out. The mice weren't anywhere near circuitry as the bottom of the box isn't used. I could not see how they got into the box because there isn't a hole large enough for them, I thought. Then, the local NBC station ran a story about how people are finding mice and rats in their homes and how pest control companies are getting all sorts of calls now. Rats, like any other mammal, are cold in this weather and are trying to find warmer places to go. What I didn't know is that a rat can get into a building through a hole the size of a quarter; a mouse gets in through a hole the size of a dime. The pest control person they interviewed said, "If they can get their nose in, the rest of them will follow." No wonder I have a battle. I'm sure there are holes I haven't found. He said that, unfortunately, we need to wait until spring to adequately assess an infestation because they are, most likely, coming in through holes in your foundation and you can't see them because the holes are covered with snow. A month and a half. A month and a half. In the case of the nest in the circuit box, removing it and putting one of my organic mouse repellent bags on top of the circuit box will keep them out. Still, I was mortified. I could see them living in the walls, but not in the box. I'm extremely impressed with Ryan. He followed the line which controls the overhead lights. It went up into the kitchen. He took apart the kitchen switch and diagnosed the problem. The switch to the light was bad. Once he removed the switch and fixed a small patch, every single light lit up. He said there's nothing really wrong with the wiring that he could see. Oh yes, it's old, but it can still pull a current. If I was going to completely remodel the house, then I'd need to redo the wiring, but if all I want is overhead lights, the wiring's fine. I now have all the overhead lights working, except the one in the kitchen. That requires the switch which he didn't have on him. So, because he has to come back, I thought, this is what I've always wanted to do, replace the overhead lights with shiny new fixtures. Above is the light in the home office. I have no idea where the globe is for it. If I'm dedicated to replacing all my light bulbs with compact fluorescents, and I am, then let's update the fixtures too. This will be "easy". 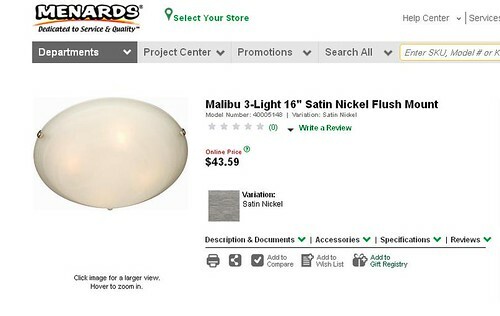 I'll just log onto the Menard's web site as that's where Ryan said he'd go to get what I want. I'll pick out three I like and he'll go get them. Piece of cake. Twenty-five pages of light fixtures later...I am totally overwhelmed. I finally sorted by price. 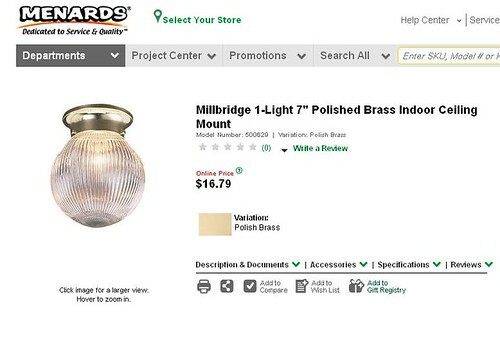 A $150+ fixture is really not what I want in any of the rooms. I want 2-3 lights in the kitchen. I don't want a chandelier. I don't want to have to dust that every month. 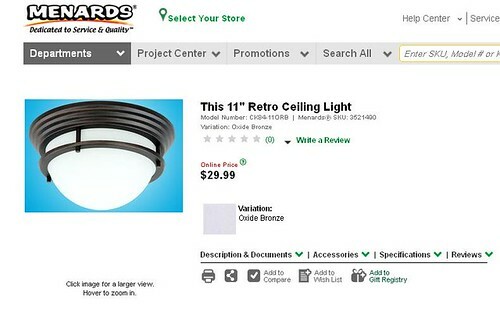 While the Tiffany-look fixtures are lovely, I don't have the room design for them. Slowly, I was able to weed out what I didn't want, leaving what was appropriate and within the price I set for myself. Then, I printed out the couple handfuls of lights I liked and taped, yes, taped, them to the ceiling. It's kind of like grabbing a handful of paint chips and taping them to the wall. Yes, I like this. No, I don't like that. It took 5 days, but I've finally picked out my fixtures. This will go in the back bedroom. It's a very simple fixture but I like the elegance of it. Some day, I would like to make that an extra bedroom. I did do some work in there, but I really need some contracting help to replace some plaster. That kind of work is a ways off. This will go in my home office. I like the retro look. It will be nice and big for a room where I spend a lot of time. I've wanted to redo the room, repaint the walls, pull down the very old wallpaper and replace it with paint. That involves moving a lot of stuff which is not really something I'll tackle now. Having fresh lighting will make the room more fun. Finally, here is the kitchen light. Three lights in a large fixture. This will significantly flood the room with light during those dark winter days. I like the modern look of this and with it being flush against the ceiling, it does and doesn't draw attention to itself. All of these are subject to availability and whether they will accept CFLs. The next step is to wash the kitchen ceiling around the fixture area. That's a job for several days. I have an eye doctor appointment upcoming so I took a day off around that. The long dark night of the back half of the house is over. I keep forgetting I have lights in the back bedroom and my home office because I've done without for so long. I realize that, if I were to sell the house this year, it would be a tear down because it's too small for anyone other than me. But I hope to live here for many more years so why not fix these things. Next step is to have a weekend where it doesn't snow so I can clear the drive and Ryan can get his car in the drive instead of parking it on the street. That's not this weekend. If you need me, I'll be on the step stool in the kitchen.